Easily one of the most iconic bands of all time, The Rolling Stones truly need no introduction. Therefore, it should come as no surprise that tickets tend to sell out quickly whenever the Stones go on tour. The exciting atmosphere of a Rolling Stones concert often creates an ideal environment for advertising. Jeep certainly seems to think so, as it is sending a host of it vehicles alongside the Stones as they embark on the second half of their No Filter European Tour on May 17. The European tour, which will span three months, will take the Rolling Stones to six separate countries: the United Kingdom, Ireland, France, Germany, the Czech Republic, and Poland. This tour will be especially iconic for the U.K., as not only are the Stones originally from England, but it will be the first time in five year when the band performs at local venues throughout the U.K. While the Stones are rocking out on stage, Jeep will have special areas at the shows where it can showcase the latest and greatest of its vehicles. The shows are already expected to sell out, which means plenty of potential Jeep customers. 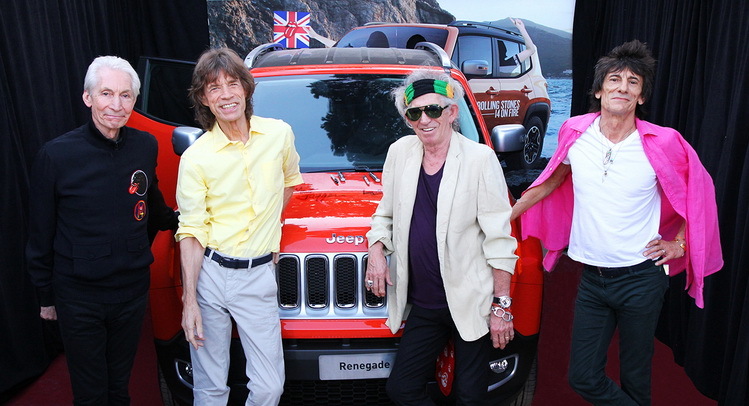 “The partnership reunites two icons with much in common – the Stones who revolutionized rock music with their unmistakable sound and style, and Jeep, the legendary global SUV brand, that for more than 75 years has been the most authentic expression of motoring freedom and adventure,” said Jeep in a statement. This isn’t the first time that Jeep has helped sponsor one of the Rolling Stones’ tours. The automaker partnered with the band back in 2014 for the Stones’ 14 on Fire Tour.